In managing risk at the plant, measurement of oxygen concentration in process gases is, of course, a matter of necessity. Engineers typically use sampling systems for these measurements. 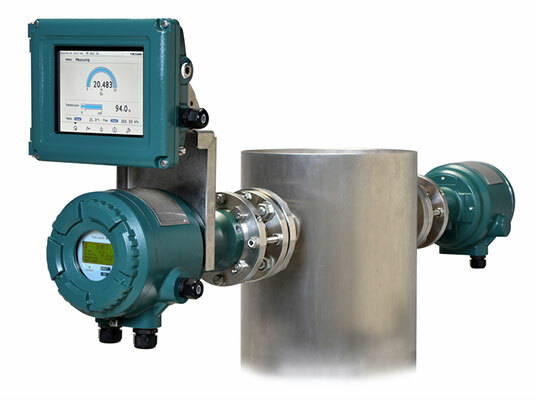 However, samplers do not provide real-time values because it is necessary to extract the process gas, resulting in a time lag between measurement and phenomena. Unfortunately, this lag can hide sudden rises in concentrations of oxygen that may cause explosion. The reality is that sampling systems do not fully provide what is needed for managing risk. 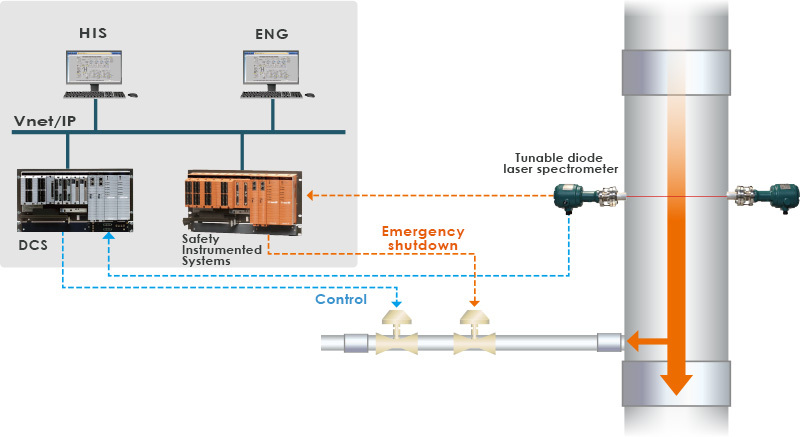 Resolving this problem is Yokogawa's safe oxygen measuring solution featuring the TDLS laser gas analyzer. The TDLS can measure process gas directly in 5 seconds or fewer, and can keep your initial and running costs down. And it's highly safe—it has certified conformance to the SIL2 safety level of the IEC61508 international safety standard. Yokogawa's solution has been used in a variety of measurement applications including oxygen concentration in oil refinery hydrocarbon vapors, oxygen concentration control with ethylene oxide reactors, and oxygen concentration in tank headspace gas. Not only is it safe, but it also helps increase manufacturing efficiency. What is the TDLS Gas Analyzer? The TDLS series is installed directly on the line. By irradiating process gas with a laser, it can measure not only O2, CO, CH4, NH3, and H2O, but also concentrations of various gases that have absorption in the near-infrared region. The laser is partitioned behind a glass window, and does not come into contact with the process gas. Therefore it delivers stable measurement under harsh conditions including high temperature, high pressure, corrosive and irritant gases, and dust. As the successor to the TDLS200, the TDLS8000 has increased functionality through smarter design, featuring a touch panel for greater ease of use. 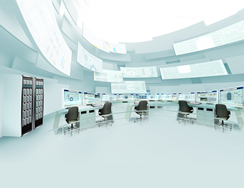 By connecting to a safety control device that alerts a remote monitoring room or provides emergency shutdown, data measured at 5-second or shorter intervals can quickly respond to unforeseen events. The TDLS8000 is certified to conform to safety level SIL2 based on the international IEC61508 standard, and a single unit can be installed in an SIL2 safety loop. With 2 units, the TDLS8000 can be used in an SIL3 safety loop. Finally, in the worst case scenario, the explosion proof specifications of many of our models minimize damage. To enable analysis of process gas with sampling systems, it is necessary to adjust for pressure and temperature, and to eliminate dust and humidity as these can alter the nature of the gas itself, and degrade the reliability of the data. The TDLS Gas Analyzer does not transform process gases as a result of measurement. And in solutions with other instrumentation, you can perform data correction and output accurate numerical values in a variety of conditions. Troublesome sampling systems are not required, and since the laser section doesn't come into contact with the process gas, there is no wear on parts, and virtually no running costs. There are several installation options to flexibly support most existing lines. Also, since it is partitioned off from the process line with a solid glass window, it maintains a high level of safety even if by chance you have to switch out measuring devices. Yokogawa Electric offers a fast and reliable solution that directly measures process gas, setting a new standard of safe oxygen instrumentation. Many interfaces are available for output of measured data, enabling connection with a wide variety of instruments in systems. 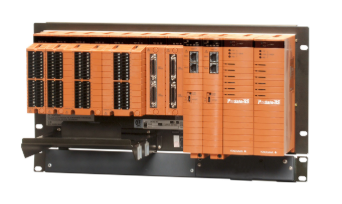 By combining products that conform to functional safety standards such as the ProSafe-RS "safety PLC" and EJX/YTA field instruments with CENTUM and other process control systems, we meet our customers' diverse needs by offering a comprehensive solution for efficient and safe operation of the entire plant. Yokogawa’s new TDLS™8000 houses all of the industry’s leading features in one robust device. The platform design is for in situ measurements which negate the need for sample extraction and conditioning. Tunable Diode Laser Spectrometer (TDLS) is a laser-based gas analyzer with fast-update optical analysis.